I am really excited about the finished artwork in the final version of The Wonderling! Did the art come first and inspire the story or was it the other way? The Wonderling has this fantastic darker flavor to it at some points – in a similar way to Roald Dahl. And the cruel Miss Carbunkle reminds me of one of my favorite villains Miss Trunchbull. Did you like darker books as a child? One of the fascinating aspects of this book is the wielding of power. For example, Miss Carbunkle bestows small little favors or a bit of extra food to some of the prisoners in the orphanage as a way of pitting them against each other. Can you talk a bit about how power is used by characters in this story? One of the aspects that I loved about this book was the role that music played in it. Songs are forbidden in Miss Carbunkle’s orphanage and then – music plays a bigger and bigger part as we get into the story. Can you talk a bit about how music has played a part in your own life and how those experiences may have influenced this story? 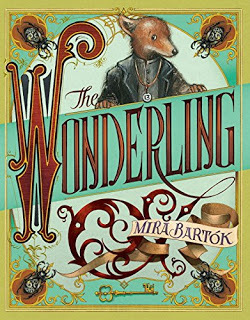 The Wonderling isn’t even released yet (it come out September 26th) – but, did I hear that already it’s going to be made into a movie? In our world, or maybe just in the context on this story – do you think that understanding each other and developing empathy is enough to avoid conflict or are there some problems too big for that? When you were writing The Wonderling, were there other versions or storylines that you played with or did you come into it knowing exactly where you wanted to take the story? A thought that struck me as I was reading The Wonderling was how powerful imagination can truly be. How has that force played a part in this story and maybe in your own life? As a writer, are you more of a tinker, trader, forager, or a foe? When we first meet Arthur in the Home for Wayward and Misbegotten Creatures, that is his name from his tag around his neck. And even later when he’s in a rather dire situation, that number 13 get attached to him again – he just can’t quite shake it! Is 13 unlucky for you?